Hello, again! It's Andrea with you today sharing another Christmas card. Do you do any holiday baking? My daughter loves to help me bake, but I think it's only because she likes to lick the bowl and spoons! 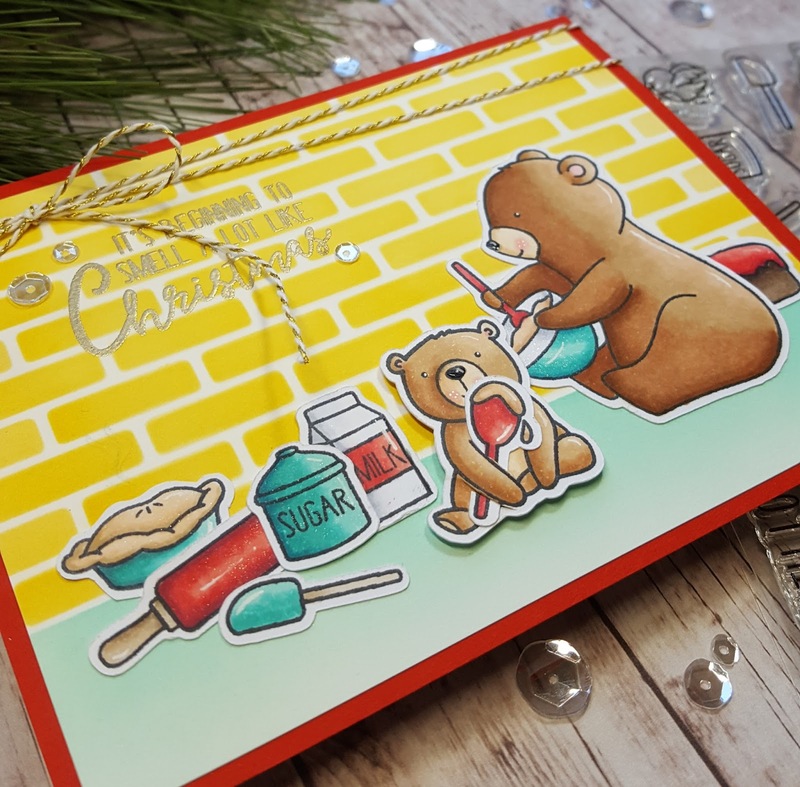 On my card today, Little Bear is helping Big Bear bake some yummy goodies for Christmas. As you can see, he got a little bit distracted - just like my baking partner tends to do! I stamped all of my images with Memento Tuxedo Black Ink (my go-to for Copic coloring) and colored everything with my Copic markers. As usual, I couldn't resist adding some accents with a white gel pen and some sparkle with clear Wink of Stella. To have Little Bear holding the spoon he's licking, I used a craft knife to make two slits around his arm and slid in the spoon, after trimming its length a bit. My background was created with MFT Stamps' Small Brick Wall Stencil and distress inks. The wall was ink-blended with Fossilized Amber; and the floor, with Cracked Pistachio and Peacock Feathers. I stamped the sentiment from Holiday Baking with Versamark and heat-embossed it in gold. After adding some Glossy Accents to the bears' noses, I finished the card with some twine from my stash and clear sequins from Pretty Pink Posh (my faves!). Thanks for stopping by, and I'll see you soon!